Feb. 12. By Dave Vieser. 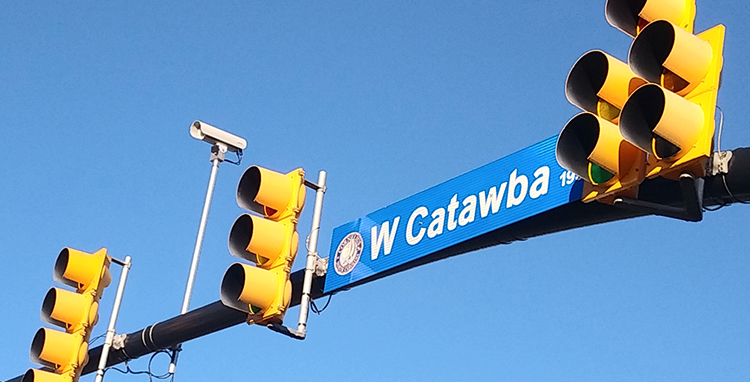 The initial reaction to the Adaptive Signal Control system—traffic lights that communicate—on West Catawba seems encouraging after only one week on the job. The system changes the way the traffic signals operate from Hwy. 21 to Jetton Road, in an attempt to improve traffic flow. The new system works by analyzing traffic metrics through cameras and uses radio transmitters connected among the seven intersections to operate the traffic lights in the most efficient way possible. It’s worth more than $500,000. Presumably, it will save countless hours over the course of months and years. The activation of the new system had been delayed by about a month because of problems with network security. It turns out NCDOT had never had a third party connect to their computer network before, so there were security concerns. Town Commissioner Kurt Naas, a self-taught expert in the world of traffic and government, says motorists should notice a big difference. The town is paying $152,000 for the system, far less than the cost. NCDOT is contributing $161,000, while Rhythm Engineering, which designed the program, is contributing $235,000 to help get a foothold in the North Carolina market.